Our kitchen nook gets a lot of use. Snacks, homework, crafts, decorating, meals, it all happens here. Our previous table was the perfect shape and the perfect size, but… it did have flaws. 1. Light weight / If anyone leaned on it (especially Chloe!!) it would lean or tip. 2. Laminate top over press board / Somehow the laminate would get slits or tears on the top and if any moisture touched it the table began to swell. So after years of use it was basically covered in swollen blemishes and bumps. 3. The Base was plastic / Feet prints were always all over the base. I was constantly scrubbing them off. I was at the point where I could no longer clean the table top and was in desperate need of a new one. My only problem has been finding something the exact size needed. All of the options I came across were either too small or too large, basically our nook has a Goldilocks complex. I was searching for a table on Perigold and saw a brass and marble base table that stopped me in my tracks. And wouldn’t you know, it was the exact size we needed!! Done. It solves all of my issues, it is sturdy, durable and easy to clean. Oh, and did I fail to mention that it is gorgeous!!!?? I can see this table being with us for a long time. 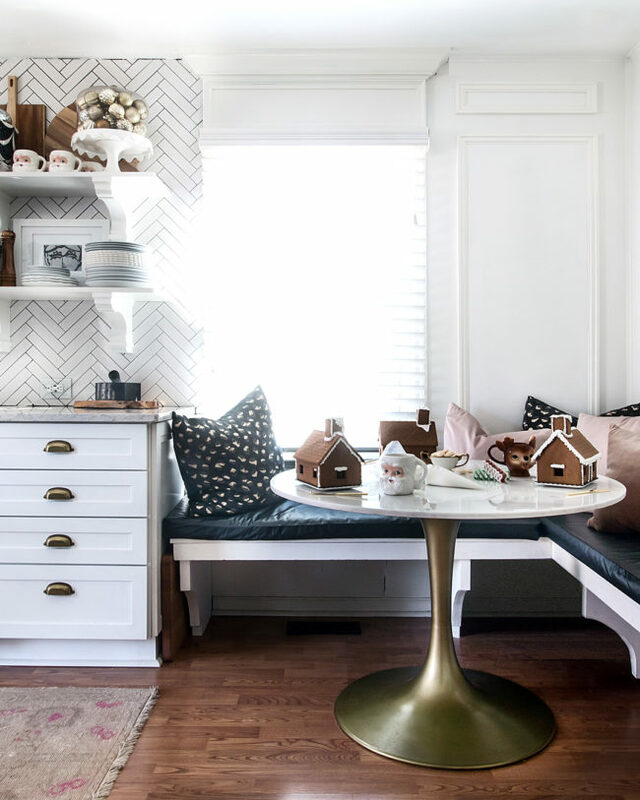 It works perfectly in this location, but down the road it would be a great entry table or be a great desk alternative in an office. 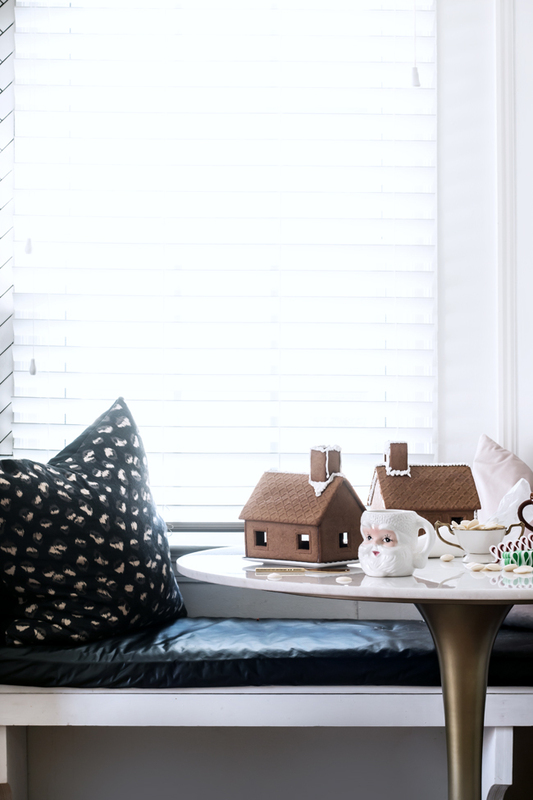 Our table arrived just in time for Chloe and a few friends to have their annual Gingerbread decorating party. And survived three girls leaning on the table with no wiggles. It was also a breeze to clean up. The top is mostly white with very subtle gray veining. Obviously this will depend with each table, but there isn’t a strong pattern with this top. Also, if you are doing Gingerbread houses this year, I have a GENIUS tip!! My friend came up with it and I knew I had to try it out. Instead of messing with the frosting to try and stick the houses together, use hot glue!!! They were instantly solid with no chance of the roof sliding off or a cave in! I assembled three houses in fifteen minutes! Never would have happened using royal icing. The only time this would be an issue is if you were looking to eat your house, but after displaying ours for a month they just end up in the bin. So from now on I will be glueing our houses together. 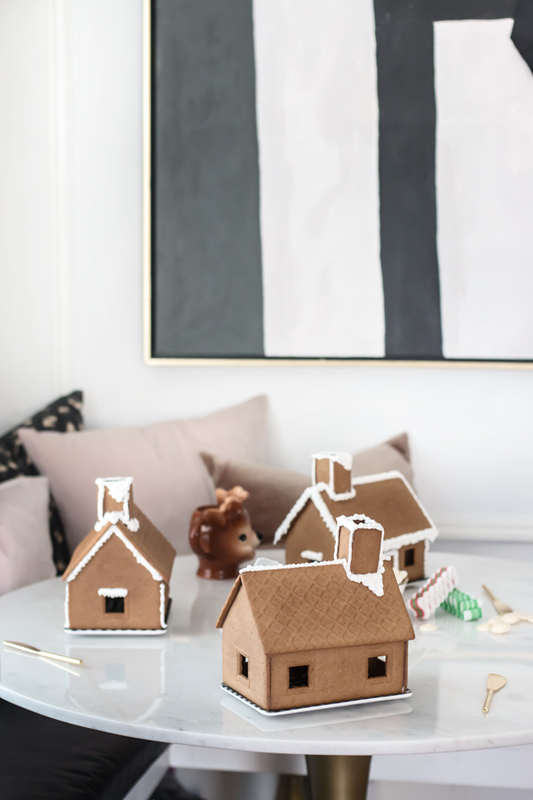 And btw, these adorable Gingerbread houses are only $3.99 at Ikea!! I love the sweet and simple shape. 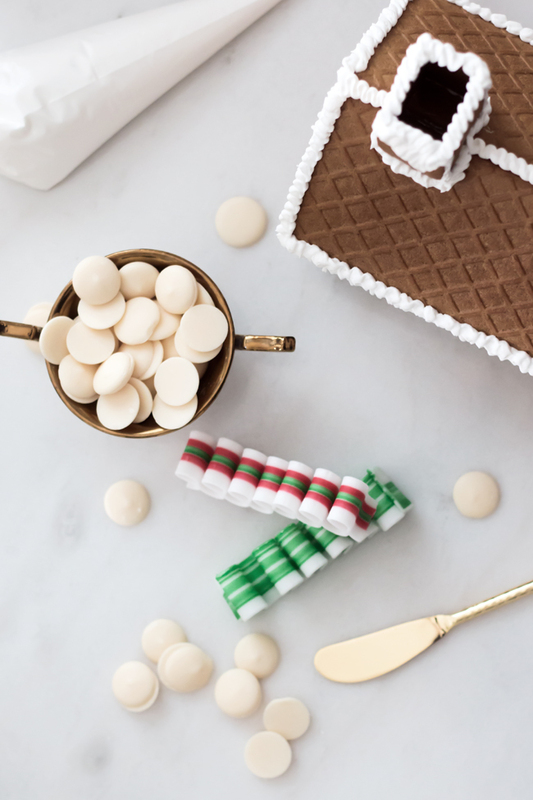 I am looking forward to rolling out our Christmas Cookies on our new table and decorating them for Santa with the kiddo. It is so nice to be able to have a functioning table again & the fact that it is a stunner doesn’t hurt either. Table was provided by Perigold. Images and opinions are my own.